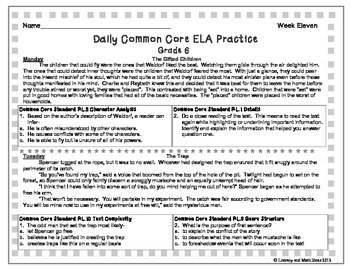 Quick, Daily Common Core ELA Practice! Five weeks are included. 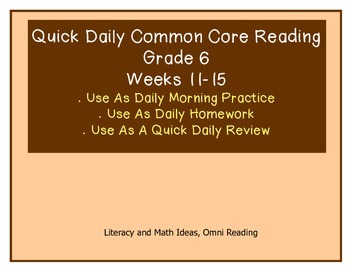 This document is a convenient way to cover and review the Common Core Reading Standards in 5 minutes a day. Use these short passages as a daily activity when students enter the classroom, as nightly Common Core homework, or as a quick daily refresher. Each week is thematic so students learn informational and literature topics as they prepare for the Common Core Standards. Answer keys are included. 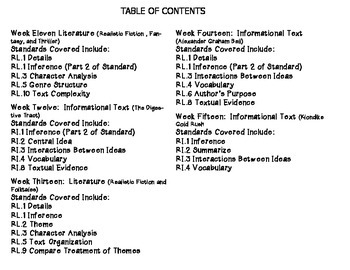 These quick, short passages and questions are aligned to the Common Core Standards and Common Core Publisher Specification Documents. Click the red star next to Literacy and Math Ideas to get updates and freebies as well as upcoming new products.